Deepsessions returns this week with one of their best releases of the year. 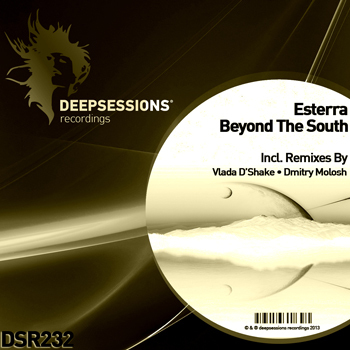 The 232nd release on the Greek label features a new single from Esterra which includes remixes from two of this years hottest up and comers Vlada D’Shake & Dmitry Molosh. The “Beyond The South” original leads the release off with a gorgeous musical vibe. Lovely atmospheric qualities and a shimmering breakdown highlight this breathtaking composition from Esterra.The first remix comes from Vlada D’Shake who is making his first appearance on Deepsessions here.The Serbian producer continues to impress not only his close electronic music contemporaries but also Charlie May who recently included one of his remixes in a set for John Digweed’s “Transitions” radio show.Vlada’s “Beyond The South” interpretation takes the amazing melodic elements of the original and recreates over a very funky groove that’s going to be perfect for a large range of dance floors.The final remix is supplied by Dmitry Molosh who is also making his first appearance on Deepsessions.The Belarus based producer has been building a solid discography over the last year with releases on Agara Music, Magic Room, Sleepless Nights and Reelaux Digital. Dmitry’s “Beyond The South” interpretation is perhaps one of his most heavenly sounding productions to date. Drifting melodies, angelic vocal pads, twinkling keys and a solid club foundation all combine to close the release out on a very strong note. Great vibes all around here. Highly Recommended.